Die Hard 2 was based on a novel called 58 Minutes, which wasn't in the same series as the book the first Die Hard was based on. 58 Minutes was published a year before Die Hard came out, meaning it couldn't have been inspired by the movie's success. I suppose the writer might have been inspired by the novel "Nothing Lasts Forever" (there are a lot of parallels), but I don't see any evidence for that. Interestingly, both novels involved the hero (whose name wasn't John McClane in either) trying to save his daughter. The movies changed it to his wife on both occasions. I guess the producers read the book and decided the premise would work well for the second movie in this series. I'm not sure I agree. Die Hard 2 isn't really a bad movie, at least not when compared to most action movies from the 80's and 90's, but it's impossible to overlook its shortcomings in comparison to the original. 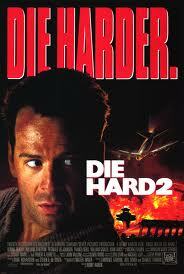 The original Die Hard remains the epitome of the genre: in contrast, Die Hard 2 just feels forced. First of all, the tension around McClane's chances is gone. A key sequence in the film involves McClane discovering the villains use blanks to fake a gunfight during a key scene - I'm not sure what the big deal is: the bullets never seemed dangerous in the first place. McClane barely has to move to avoid getting hit, nor is there any suspense in the constant string of hand-to-hand fights. In the first movie, he wins because he's sneaky, clever, and refuses to give up and die; this time, he's just lucky. For what it's worth, there is some tension around Holly's predicament, though it's undercut by the coincidental presence of the smarmy reporter from part one. This movie had way too many coincidences and parallels throughout. I like a lot of Renny Harlin's work, but I think he was a bad choice to direct a Die Hard movie. He's at his best when working with super-spies and pulp heroes, while McClane needs to be grounded to work. The holiday elements, while not quite as pervasive as they were in part one, are certainly present, though they feel more like call backs than anything else. This is the last Die Hard movie to take place on Christmas Eve, which means it's the last I'll be reviewing here. If anyone's interested, I kind of like the third, was bored by the fourth, and skipped the fifth entirely.